The United States Mint in ten months this year has struck more coins for circulation than in any year since 2006, according to production figures the agency released on Monday, Nov. 9. The U.S. Mint is on pace to strike more coins than in any year since 2001. Over 1.75 billion in pennies, nickels, dimes and quarters rolled out of U.S. Mint coining presses in October, the highest on record for a month since CoinNews started tracking the data in 2007. Pennies costs about 1.7 cents each to make and distribute, yet the Federal Reserve always orders more of them than any other denomination. In October, the U.S. Mint produced 950.8 million Lincoln cents. That’s 54.1% of the circulating-quality coins made for the month. 14.5% more America the Beautiful Quarters. Presidential $1 Coins, Native American $1 Coins and Kennedy half-dollars are no longer ordered by Federal Reserve Banks but the United States Mint continues to make them for coin collectors. U.S. circulating coin production facilities are located in Denver and Philadelphia. Last month, the Denver Mint produced 846.48 million coins and the Philadelphia Mint made 911.16 million coins. For the January to October period, the Denver Mint struck over 7.6 billion coins while the Philadelphia Mint made more than 7.4 billion coins. Their combined output tallies to 15,093,180,000 coins for a 31.9% increase over the 11,446,140,000 coins minted through the same months in 2014, and the most for a year since the 15.5 billion coins in 2006. For another perspective of the sharp production increase, last year’s 12-month total reached just over 13.28 billion coins. This next table lists year to date totals by denomination. 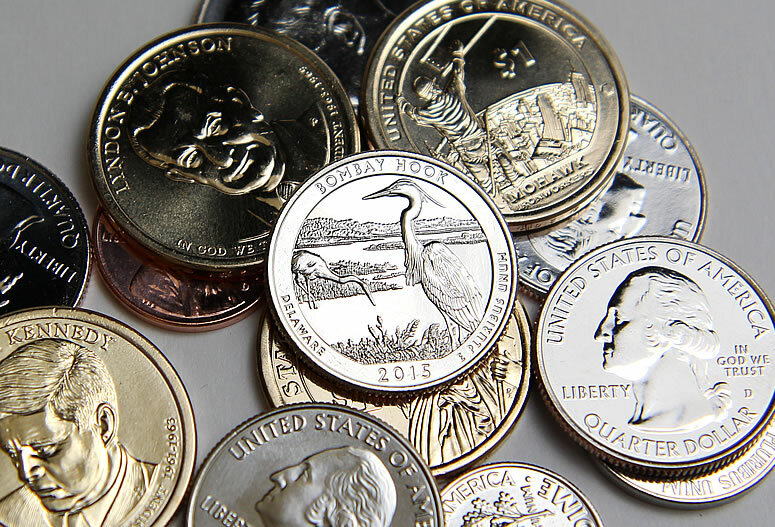 The U.S. Mint is averaging a monthly pace of over 1.5 billion coins. Stretched through 12 months, the agency is on track to make 18.1 billion coins this year. In all likelihood, the ending figure will probably be more in the 17 to 17.5 billion area since production usually tapers off in December. That said, such a level has not been seen since 2001 when over 19.4 billion coins were pressed. Mintages for this year’s fourth and twenty-ninth overall America the Beautiful Quarter, which honors Bombay Hook National Wildlife Refuge in Delaware, are 206.4 million from Denver and 275 million from Philadelphia for a combined 481.4 million. That’s 42% lower than the previous quarter commemorating Blue Ridge Parkway in North Carolina. It, at 830.8 million, posted the highest mintage in the America the Beautiful Quarter series to date. Bombay Hook quarters entered circulation beginning on Sept. 14 and the U.S. Mint began selling rolls and bags of them on Sept. 30. There is one difference when subtracting coin totals by design from those by denomination — mintages of America the Beautiful Quarters are higher by nearly 218.82 million. These are a portion of the Saratoga National Historical Park quarter for New York. They enter circulation starting on Nov. 16 and the United States Mint will sell bags and rolls of them on Nov. 30. And those 8+ billion pennies end up in about 500 million jars on counters, bureaus, tucked in closets, etc. There should be a “turn in your change for no fee day” at banks once a month. This would help bring back so much of the change that sits unused in jars and nightstands, etc. due to the 10% fee that most banks charge to deposit loose change amounts over $5 dollars. Not a bad idea. I haven’t turned in any change for quite a while since I use credit cards mostly these days but didn’t like having to roll the coins myself and especially writing my account number on the roll for anybody to see. Didn’t cost anything then but maybe all that’s changed now. Before when I had too much change accumulated I would take it along with me when I went to Las Vegas and gave it to the cashier. All the coin processing was done for free, no rolling and no account number. At some stores around town there are coin counters where one could dump their loose change for a 7% fee the store would charge. That’ll save you 3% but maybe their fee has gone up to 10% by now.